Every genre of film has an iconic figure that immediately springs to mind. If someone mentions cartoons, Mickey Mouse jumps to mind, Sherlock Holmes if we’re talking detective and if anyone mentions international spies or MI6, James Bond surely pops his head out first. These characters become the face of their specific genres, setting the benchmark and a mould that future characters have to strive to achieve. When the topic of stop-motion animation is brought up, the names Wallace and Gromit are sure to follow. Although, where do these iconic characters come from? That is where Aardman Studios, the company behind Wallace and Gromit, come in. British based, Oscar winning animation studio, Aardman Studios, is without a doubt one of the leading companies when it comes to model animation. 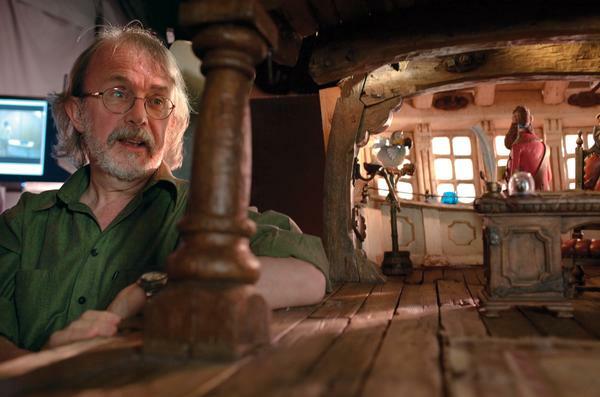 Founders, David Sproxton and Peter Lord, met at school and their friendship was spurred on by their shared fascination with special effects and stop-motion animation. Sproxton’s father noticed the boy’s interests, this was before the times of smartphones and mobile slots, so he loaned them a 16mm camera which they used to experiment with animation, using their kitchen table as a set. The two were then approached to produce a short piece for ‘Vision On’, a BBC series for deaf children. They created a superman-like character called Aardman, and thus, Aardman Studios was born. As time went on, Lord and Sproxton hired three more animators, one of them being Nick Park, who would later go on to create the characters of Wallace and Gromit. The animators created five shorts called “Lip Synch”. Of the five shorts, ‘Creature Comfort’, directed by Park, went on to win the first Oscar for Aardman Studios. Park then developed the clay modelled shorts featuring the adventures of Wallace, the absent-minded inventor and cheese lover, and Gromit, his highly intelligent and completely silent trusty companion. These films include ‘The Wrong Trousers’ and ‘A Close Shave’, both of which won Academy Awards. In partnership with DreamWorks Animation, Aardman’s first full-length theatrical feature film came in the form of Chicken Run. 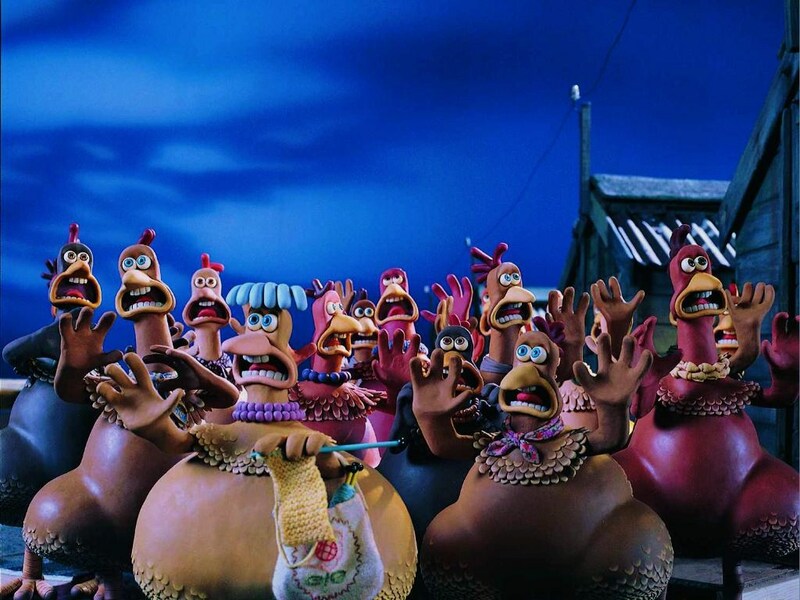 Released in 2000 and directed by both Lord and Park, Chicken Run was met with excellent reviews and outstanding box office receipts, but this was only the beginning of Aardman’s role in stop-motion animation featured films. They went on to create ‘Flushed Away’, their first computer-animated feature as well as ‘Arthur Christmas’, their first 3-D feature and then ‘The Pirates! Band of Misfits’, their first 3-D stop-motion film. In 2010, Aardman renewed their three-year deal with Sony Pictures Entertainment to finance, co-produce and distribute feature films, so make sure to keep your eyes open for their next masterpiece. The Pirates! In an adventure with scientists (released as Pirates! Band of Misfits) is a stop motion animated adventure comedy released in 2012 . It is produced by Columbia Pictures and created by Aardman production. The film presents the first book from a series of Gideon Defoe‘s The Pirates! At the time of production the laminated thin film “Rapid Prototype” was used instead of plasticine. Different facial animations were printed with a special 3D Prototyping printer and were painted by hand. Peter Lord first read Gideon Defoe’s “The Pirates! In an Adventure with Scientists” book during a development meeting, where a copy brought up by Aardman’s Jim Campbell was lying on the table. He picked it up and starting reading it and couldn’t help but laugh out loud. 525 People worked on this animated film, including 33 animators. The shooting group consists of 41 workers in 4 studious. The pirate ship was completely hand crafted and made up of 44,569 parts. It took 5,000 hours of development and ended up weighing 770 pounds. The pirate ship is about 14 feet long from the tip of the bowsprit to the tail-end of the rudder, and it is 15 feet high. When the Aardman crew tried to move the pirate ship from one studio to another, they had to wheel a complete behemoth, weighing about a ton, through some remarkably narrow corridors. After barely managing to navigate it round a number of improbably tight corners without bits of it falling off, crew members finally reached the double doors to the last studio… only to find it wouldn’t fit, because the mast was too big. With a dogged refusal to go back the way they came but with no way of actually fitting the ship through the door, they got a saw and had to cut a hole in the door frame! Queen Victoria’s treasure room boasts over 400,000 gold coins. 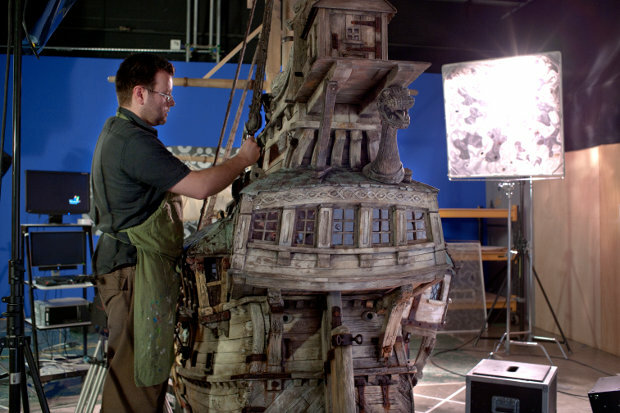 Aardman’s prop team also created more than 220,000 background, key and animatable props to fill the film’s sets. 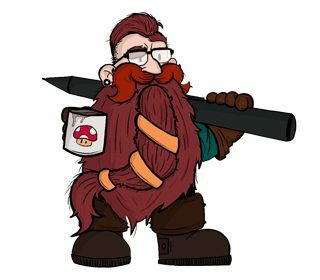 140 sets of eyelids were created for the key pirate crew. If you look closely during the scene in Queen Victoria’s treasure room, you may spot a gold Shaun the Sheep, Wallace, and Gromit! There are beer mugs with the faces of Peter Lord (Director) and Jeff Newitt (Co-Director) in the Hook Line and Sinker pub. The animators make the characters speak by using mouth replacements – each character has a different set of mouth replacements depending on what the character needs to say, which attach to the head by magnets. 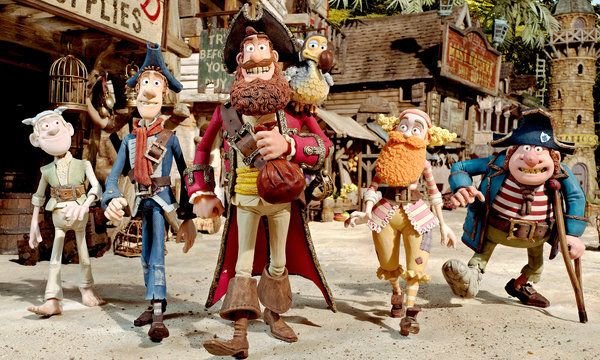 Over 6,818 puppet mouths were created for this movie, including 1,364 for the Pirate Captain alone, along with 257 mouth shapes to convey his speech and reactions. Each mouth was designed on the computer first, complete with teeth and tongue, and was then “printed” out via a 3D Rapid Prototyping printer. Every mouth was pre-posed in a shape that relates to the vowels that are most often used. Queen Victoria’s mouth is one of the most time consuming to make because the lipstick on each has to be individually masked and painted. “Pirates! Band of Misfits” is an animated film that cannot be left without attention. This wonderful work guarantees a good spirit for the whole day as for children as for adults.